** Out Of Stock Until 4-1. Please Note: If you look at the You Tube Video on Coconut Kisses from 2013, you will see the old packaging with the Ed Hardy sticker on the cap. The newest version of this lotion does not have that sticker, as you can see from their website. Armies of natural-beauty lovers swear by coconut oil and coconut milk for just about everything health and beauty. Coconut oil is used in many natural beauty products because it’s naturally antibacterial, antifungal, it can penetrate the skin better than other oils, it moisturizes unlike anything else, plus it smells like paradise. As a moisturizer, coconut oil sinks in quickly so you see immediate moistening results. Add coconut milk, which has naturally smoothing properties the replace the moisture in dehydrated skin over time, and you have a coconut recipe for brilliantly soft and hydrated skin. 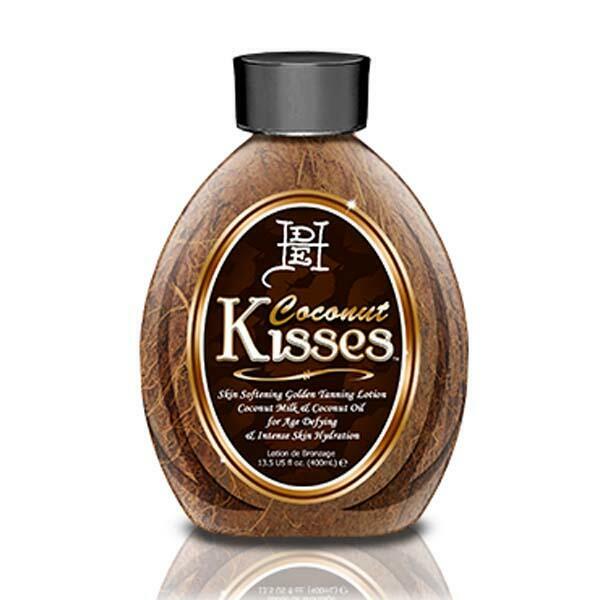 Then, as Ed Hardy tends to do, Coconut Kisses offers several bonus effects that are jaw dropping. Skin tightening, cellulite reducing, and melanin enhancer…this lotion leaves no coconut unturned. When you love your skin, it shows!